At Hasmonean Primary our whole school community is actively encouraged to engage with modern British life and embrace British Values. We provide an environment where our children learn the skills to be thoughtful, tolerant and caring citizens. We prepare children to take on active roles and responsibilities in wider British society in later life. This is achieved through both the secular and Jewish Studies curriculum and the School’s ethos, “Torah Im Derech Eretz”. In addition, British Values complement the Jewish values that are incorporated in all aspects of school life, during assemblies and through school events. Democracy is promoted through teaching an understanding of what a democracy is, how it works and by discussions and modelling voting. 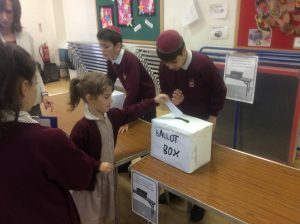 Children enjoyed holding their own ‘national elections’ and referendum to decide the future of Britain in the EU. 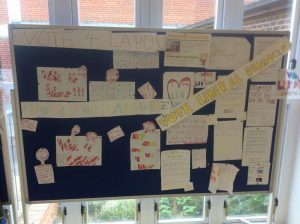 Pupils prepared speeches, canvassed on many issues, cast votes and were excited to announce results. We take our Y6 to the Houses of Parliament each year. 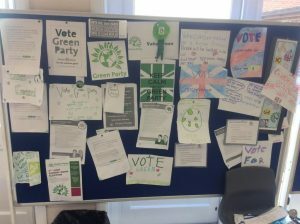 Children are encouraged to know that their views count and are valued by having the opportunity to vote and become members of our school council. Charity is an important feature in our school day and children are encouraged to be charitable. For example, we have supported many national charities e.g. the British Heart Foundation, Great Ormond Street Hospital and Make a Wish. Mutual Respect and Tolerance of Different Faiths and Beliefs is promoted in both secular and Jewish studies lessons. We encourage children to learn about other families, cultures, traditions, and communities. We hold termly multicultural weeks to promote solidarity with immigrant groups in the UK – these have included Chinese, Indian, French and Polish weeks. We also held a UK week to celebrate the Queen’s 90th birthday. We have formed a link with St Joseph’s Catholic School, Southwark with exchanges of letters between our Y5 pupils and reciprocal visits. Every week, teachers select a child to wear the ‘golden sash’ in each class. These are celebrated in a weekly assembly and children take home a certificate. We promote the ancient Jewish teaching that, “the Law of the land is the law” and that, “All righteous people have their share in the World to Come”. This teaches our pupils that we must respect everyone whatever their lifestyle and cultural traditions. At Hasmonean Primary School we promote the Rule of Law by demonstrating a need to help to keep our school community safe and happy. We encourage children to work together to create class rules and teach children to understand how their own and others’ behaviour has consequences. Our school council discusses how class and school rules should be administered fairly. During Jewish Studies and PSHE lessons children are supported in understanding how to distinguish between right and wrong. Children volunteer to be part of a ‘Safety Squad’ alongside the head teacher. Within school, children are actively encouraged to make choices, knowing that they are in a safe and supportive environment. Our pupils are taught to know and understand their rights and personal freedoms and are taught how to exercise these safety during e-safety and PSHE lessons.